Did you guys hear the news? 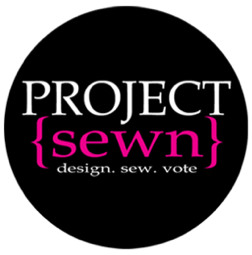 I'm a contestant on season four of Project Sewn! To those of you who aren't familiar with the site, here's the gist: six ladies are chosen to sew garments for challenges. The challenges were emailed to all of us at the beginning of this month (April) and in May we start debuting looks each week. The only catch is that there is an online voting process and based on the final scores someone is eliminated after each challenge. Kinda nerve-wracking, huh? I was super flattered that Liz and Elizabeth (the ladies behind Project Sewn) invited me to participate, but I had my reservations. My first thought was, "I'm not good enough. Why would they choose me?" Ewwww, what a lame attitude! I thought about it for a few days, called Lauren and picked her brain (guys, her voice is so cute and she is just as hilarious as I thought she would be! ), and ran it by some of my other friends. In the end I (obviously) decided to do it. One of my main concerns is staying true to myself. I don't want to make a bunch of clothes that are fancy and cute, but will sit in my closet untouched. 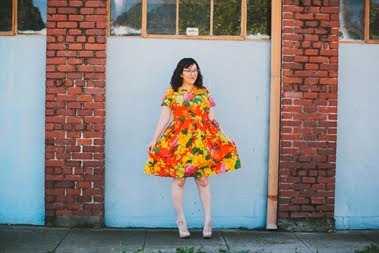 I want wearable and comfortable garments that will fit my lifestyle, not elaborate ball gowns. Sorry! However, sewing will still be a challenge for me, as I am making an item I haven't made before and I'm also trying out a fabric type that is new to me. Congratulations!!! I can't wait to see it! I DID hear the news! Exciting! You'll do great! Yay! I'm so excited to see what you make! You're going to do a great job! Yay!!! Congratulations! I'm glad you'll be representing those of us who love wearable comfy clothes. Can't wait to see what you make! WAHOOO!!! I am so excited for you! Congratulations!!! I will be avidly following! You will do great! Good luck and congrats! Congrats Erin. I hope you enjoy yourself. I know you'll do well. Congrats Erin! I know you'll do great! I'm so excited to follow along! Woohoo!!!! Good luck!! I'll be voting for you! Hooray Erin! I'm so excited that you're also participating. I wasn't familiar with the other bloggers this season, but have long followed you and loved your creations. I cannot wait to see what you make! Good luck! Thanks, Melizza! Maybe when all the sewing craziness is done we could meet up? I want to come go up north, it's been a while. Thanks, Kathy! And thanks for being nice when I said I couldn't meet up for the whole month. Ahhhh it's going to be super challenging! I'm getting a head start on things now! Yay - good luck. I am sure whatever the result, you are a winner anyway as you will end up with loads more cool garments! Meeting up would be awesome. Keep me posted as to when you come up! Maybe we can get some of the other locals together as well. This is so exciting!! I can't wait to see what you come up with and I'll be rooting for you! You'll be great! I only recognised you and Mary from this season so I am rooting for you two! Good luck. If you stay true to your usual style you will be brilliant. Congrats! You can do this girl! Love your new blog look! Also, I can't wait to see your creations on Project Sewn!